I love brie. 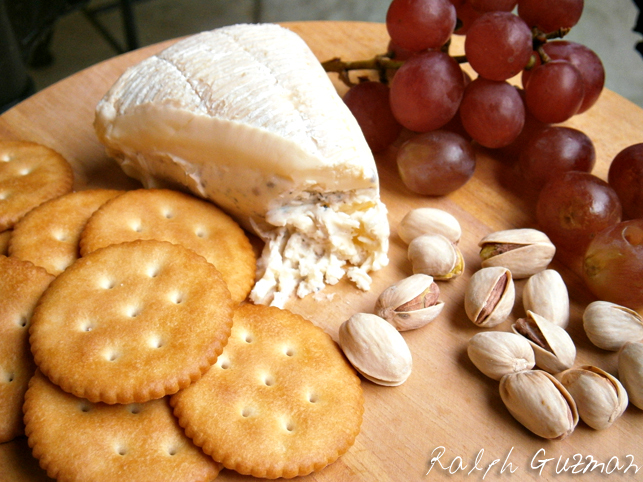 I love this rich, creamy cheese with bread, biscuits, or crackers. 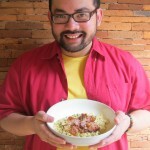 I love it with pasta, especially when the dish is topped with arugula or spinach. I also love truffles. I love making pasta or risotto with actual truffles or even with just truffle oil. So what happens when you put brie and truffle oil together? During a recent trip to Singapore, I encountered this beauty at ThreeSixty Market Place at Ion Orchard Mall. 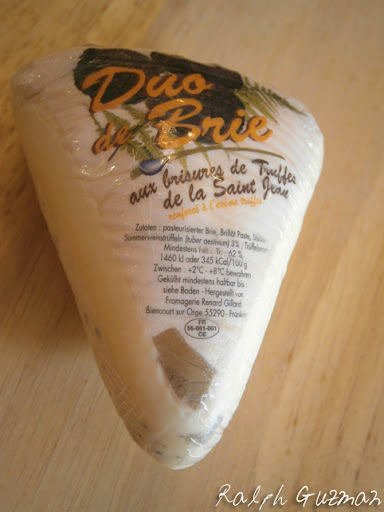 Duo de brie is simply brie with truffle. It comes at a reasonable price of 12 Singapore dollars (roughly PhP400 or US$9.50). The product is imported from Australia. Of course, being the brie and truffle lover that I am, I just had to buy it. I carefully packed it in my carry-on luggage, and brought it home with me to Manila (as to how I successfully did such a thing– that’s another story). One laid-back Saturday morning, I had it for brunch with my girlfriend, TJ. I served it on a wooden platter, with grapes, pistachio, and my favorite biscuits. And of course, I did not forget the red wine and the pasta, which served as the main dish. The verdict: the main flavor goes to the brie, with the truffle providing only a subtle hint of flavor. It’s still a good, delicious brie, though admittedly, I wanted to taste more truffle. The brie was very creamy and had a mild kick, as it was still relatively new. I was able to smell the aroma of truffle, but did not get to taste it so much. Perhaps, I’d add a few drops of truffle oil should someone give me this next time. I’d still give it a positive rating as a good partner for wine and pasta. Do I recommend a purchase? Yes and no. I’m calling a spade a spade. Buy it if you’re happy with the brie having more of the spotlight. Others may want to buy it for pure bragging rights. You can just imagine people’s jaws when you brag to them that you’re serving brie with truffles. Well, it did have that effect when I told work colleagues that I bought the product. Hehehe. Now, if you’re looking for the perfect taste, keeping it real, another kind of cheese would be the best way to go. Either way, the product makes good, intelligent conversation and debate, or an interesting product to discuss online. This entry was posted in Products & Services, Rated by Ralph and tagged Brie, Brie with Truffle, Brie with Truffle Review, Cheese, Cheese Review, Duo de Brie, Duo de Brie Review, ralph guzman, Rated by Ralph, Rated Ralph, RatedRalph, RatedRalph.com, truffle by Ralph. Bookmark the permalink. hi, what kind of red wine did you drink with your pasta, brie etc.? thanks! Hey, Kim! I’m not particular about wines in this case, but I like Australian red. Of course, French red wine always works. I’m a red wine person.